An increasing number of teachers are becoming web-savvy and are looking for ways to efficiently organize their course information for students through communication technology. For many years now I’ve created a public course website for each course I teach. 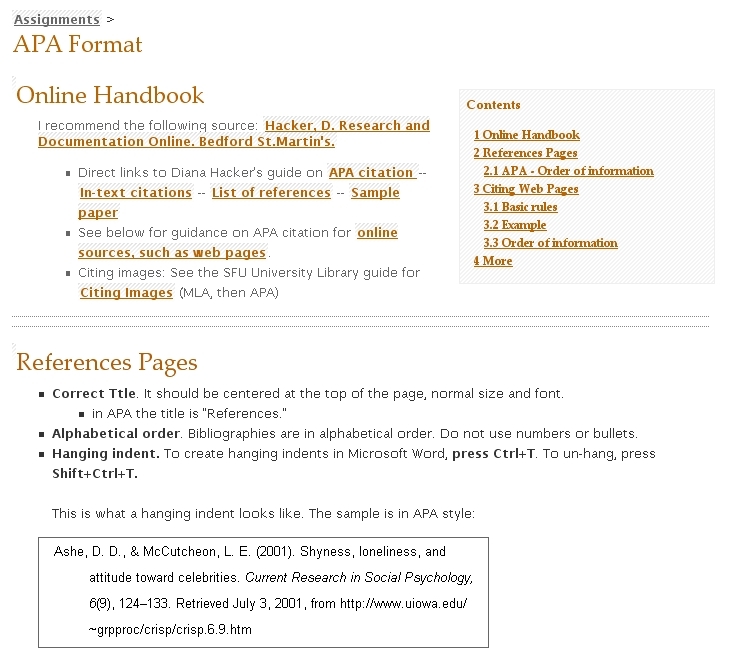 Essentially, I have created an area within my own site, an area with 8-20 pages of material: a course home page with subpages for assignment descriptions, a schedule, links, and course-specific research or writing advice. 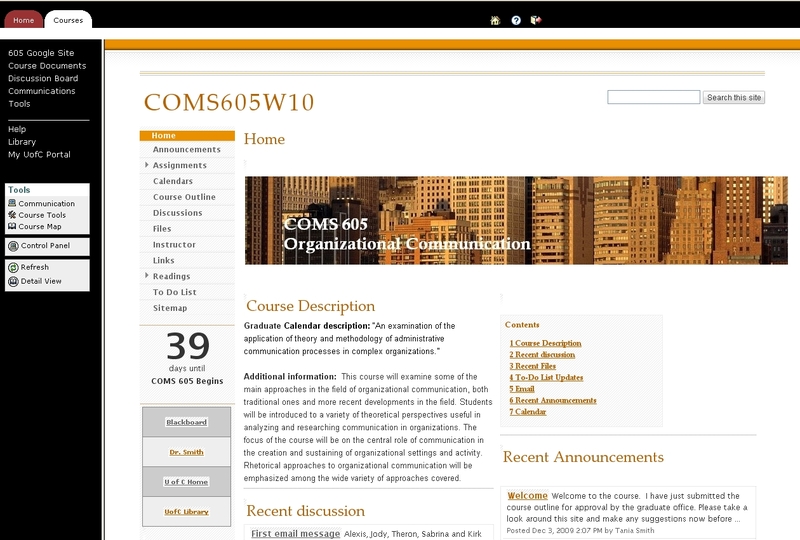 I’ve done this in combination with the “Blackboard” course management technology that has been adopted at my university, preferring the ability to craft the site the way I want, and display the non-confidential information publicly. This blog post uses my own course website to explore the benefits and limitations of using Google Sites technology, especially in combination with Blackboard, a technology used for course management at many universities. Making one’s own website is not that important for every teacher. But nowadays it is becoming more of a standard for teachers to use some degree of online communication with their students through online course outlines and schedules. I also think it is important for a teacher of Rhetoric and Professional and Technical Communication to be actively involved in crafting websites and learning how to structure information for their audiences. It’s one of my beliefs that I should be a good example of a learner of communication technologies, not just a theorist and critic of the way they are used. If you don’t understand the challenges of the process yourself, how can you guide your students through it? Over the past nine years I have gradually learned the basic technological skills needed to create and manage a website. 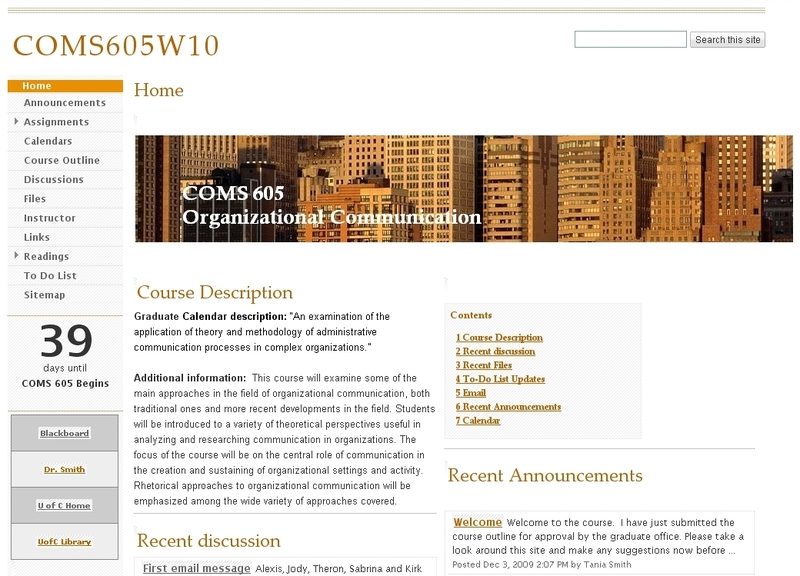 Using the server space provided by my university, I’ve used a website management software product, Dreamweaver, to create a site whose visual style and colors are similar to our university’s template. But my Dreamweaver software version is becoming out of date, and buggy, and I just don’t have time and money to fix that. The university’s preferred content management system, Drupal, is not very user-friendly, as I have discovered from taking a workshop and supervising students who have learned to use it. Another issue makes it even more awkward to craft my own site from the ground up and then maintain it. Now my university’s server requires an additional layer of security software to update pages, so I first have to update page content in Dreamweaver and then upload my files through their secure interface. SO — This month, I’ve decided to move my future course websites to Google Sites. At first I was dubious about the usefulness and flexibility of using a pre-made website template. I thought it might be useful for my students, but not for me. But I’ve actually found it quite satisfying to put together my Google Site for a course starting next month. So far, so good. I’m liking it. I can make it look jazzy in a way that I can’t with my own site because I’m merely a competent user of technology, not a trained professional web designer or programmer. It’s also accessible from any computer without having to use special web editing or file transfer software on my own computer. I’m using its strengths in combination with aspects of Blackboard technology that are too useful and important to give up, as described below. Google Sites not only allows for a menu that has sub-categories, but it also does a better job of putting the information together beside the menu bar in an accessible, at-a-glance fashion, in ways that internet users are now accustomed to. Here’s a screen shot of the site as of the time of writing. Scrolling down… see the layout features and tools I’ve chosen below. Customized layout in Google Sites allows you to choose single column, double, sidebars, etc. It also allows you to choose a color and font style. Of course, you can upload your own images. In some ways the functions of the Google Site mimic that of the Blackboard platform. As you can see, the menu items I have chosen are somewhat similar to those provided on Blackboard. I can customize my menu bar. I have created a single column table with 4 rows to add links to the left menu bar. In the right-hand content pane, I can add a variety of content types, like summaries of recent discussion messages, recent files posted, recent to-do list entries. It allows me to rename the tools and place them generally where I want. Google Sites has a built in template for a To Do List or task list, which Blackboard does not have. This is great for courses involving group work, or courses taught by teams of instructors and teaching assistants. In addition, a person can search from an enormous library of free gadgets created by Google and various other companies and individuals. Clocks, Post-it notes, Games, forms to fill in, etc. 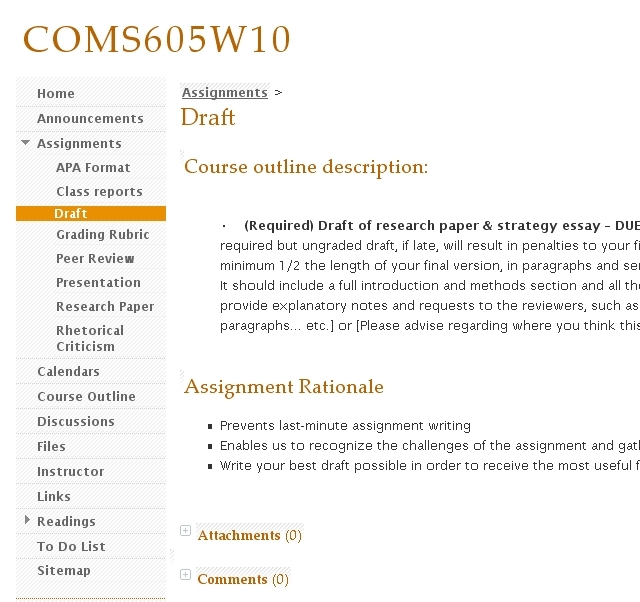 Now my assignment description pages can have attachments and comments and images. Here is my subpage for the Draft assignment. Can you see how useful this is to have the Attachments and Comments listed below it? All the information updates and assistance I’d like to provide, and help that students would like to provide each other regarding that assignment, can be found in one place, rather than having to go to different areas of the site to find them. You can add to each page a Table of Contents that populates itself automatically based on the headings and subheadings within your page. Notice the Contents block in the right-hand upper corner. You can left-justify, center, or right-justify the Contents block and wrap text around it, as shown. I’ve used Google Calendar for several years now. It works great for time management and project management. I even have it set up to synchronize to Outlook on my desktop, for safekeeping of appointments and records on my own hard drive in case the server goes down (which is extremely rare but happened once or twice). 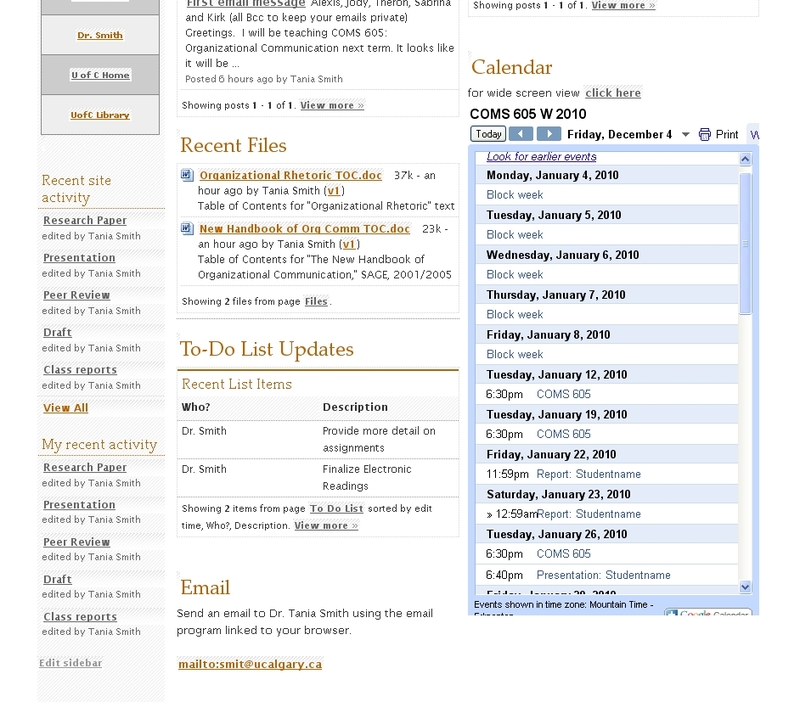 I have chosen to make my appointment book publicly available so that students and I don’t have to play email-tag just to set up an appointment. I ask students to view my calendar before emailing me to suggest a time. Saves at least 2 emails. But the real treasure is that not only can you create a course calendar that can be displayed on your Google Site, but you can also view calendars through Google Calendar and combine two or more calendars at once. 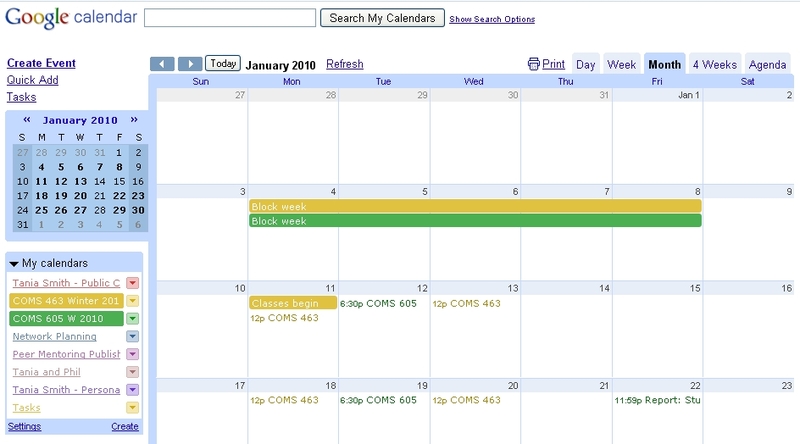 Here’s what the Google Calendar main view looks like: you can select which calendars to view, and the colors that they display in. Look at this detail: Two courses’ calendars displayed within the same grid. Two colors. The world is not perfect. Use what is useful. Learning and using their templates. Every new technology you learn will make it easier to learn the next, because the good ones tend to follow a general pattern and they are becoming more and more user-friendly. Every template is limited in some way. Google sites won’t let you customize down to an eighth of an inch or make it look absolutely perfect or artistic. Privacy. Like Blackboard, Google Sites provides a privacy setting, so you can make a site completely public, or limit it to a set of collaborators and viewers. However, in order to make your site private, people have to access it through a Google account. Not every student or instructor wants to have a Google account. Therefore, Google sites is mainly useful for setting up your public site for the course if you have a Google account. Yet — if you suggest it to students and show them how, they may want to use a private Google Site to manage their group projects within your course. They could invite you as a teacher as “viewer,” if you monitor group work to give participation scores. Storage space. Only 100MB per site. I know, it’s kind of shocking given the huge space in the Gmail area of Google. But you can create many Google Sites within each account. So 100MB per course home page. I will continue to use Blackboard’s Course Documents area for online required readings because of storage space, and copyright issues regarding course texts. 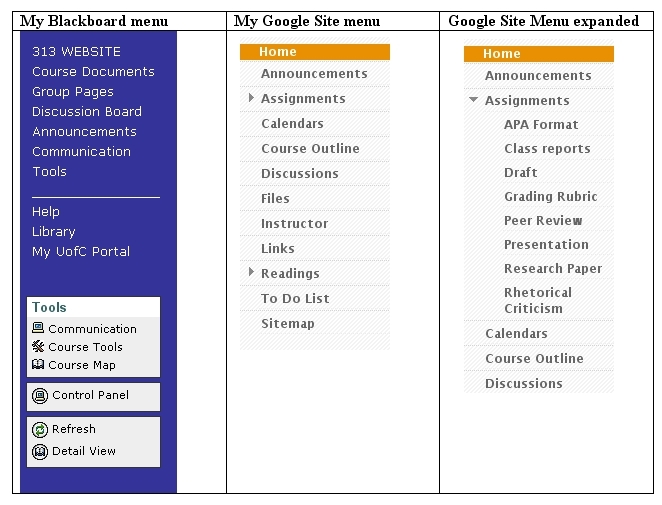 Google Sites can be viewed within Blackboard’s frame. This enables the users to access both platforms simultaneously. In the image below, notice the two menu columns to the left: the outer, black frame is Blackboard. Add your Google Site as an external link to the Blackboard menu. I will eliminate redundant menu items shown once I test the technology this term. The tools that work better with Google Sites will be found only on the Google Sites page, and those that I use through blackboard will only be shown on the Blackboard menu. Discussion is a feature that I might use in both places. In Blackboard we can keep class-wide discussion confidential more easily (not everyone wants to be enrolled as a Google user on a private Google site). This entry was posted in Higher Education, Scholarly Life, Teaching and Learning, Technology, Web Rhetoric and tagged Academic Writing, Google, Professional Writing, Teaching and Learning, Technology by Dr. Smith. Bookmark the permalink. Last semester I started using Google Sites and Gmail for teaching and course management because Yahoo stopped providing Geocities sites, which I had used for many years, during the summer of 2009. Because I only had one class last semester, I set up a course Gmail account then a Google Site for it. Everything worked well then but not this semester because of an anomaly in the way Gmail and Sites work and don’t work together. I created additional Sites from within the first Site I created and discovered that, if additional Sites are established from within an existing Site, Gmail accounts for the additional Sites are not automatically established and cannot be established. Foolishly, I assumed the Gmail accounts would be automatically created or, if not, I could create them manually. That assumption caused me to include those (non-existent) Gmail addresses on each relevant Site’s content, including the course outline, and assignments, as the email addresses for students to correspond with me and submit completed assignments. After the first week’s classes, during which I gave an assignment in each class to be submitted via email to the (non-existent) course email accounts, I discovered that no Gmail accounts existed (except for the first one), and they couldn’t be created. What an emabarrassing mess! Google should be consistent. A Gmail account with a corresponding address should be creatable for every Google Site however created. Hi Richard, you are right that they are separate services and you can’t assume that an email address is created automatically. And it is not a straightforward process to get additional email accounts either; you need to read online help files and the process is not intuitive. I personally have about 5 different gmail addresses, and one I created just yesterday so that the 4 people involved in teaching my course could use it to log in to edit the google site and also log in to box.net folders without having to use their personal email addresses (it gives them privacy). But my gmail addresses were created at separate times and disconnected from the Google Sites. I consider these Google services like different businesses that have some flexible forms of connection but not necessarily any synchronization; each has to be run by the user and made to interact by the user. I actually like it that way because it leaves me choice and does not create services I don’t want… I am not forced to use Google’s “blogger” blog; I can use WordPress instead. I’ve been using Google Sites now for a while, and I’m liking it. Yes there are limitations to the technology. But I am finding it very user-friendly and flexible. However, I’m using it more for my COMS 463 course than for the COMS 605 course profiled in this article. In COMS 463 students are authoring web content using Google Sites and WordPress Blogs, so I am posting a lot of lab material there. But I’m not going to migrate completely to Google Sites because of its limitations … maybe temporarily, partially. I recently purchased Adobe Pro CS4 software package which has a new version of Dreamweaver web authoring software that uses secure FTP. Now I hope I won’t have to use the university’s encryption software in addition to Dreamweaver. This software update may make it easier for me to update and edit my professional website on my university’s server. This may be one of my more visually creative writing/publishing projects this summer. Fantastic post! 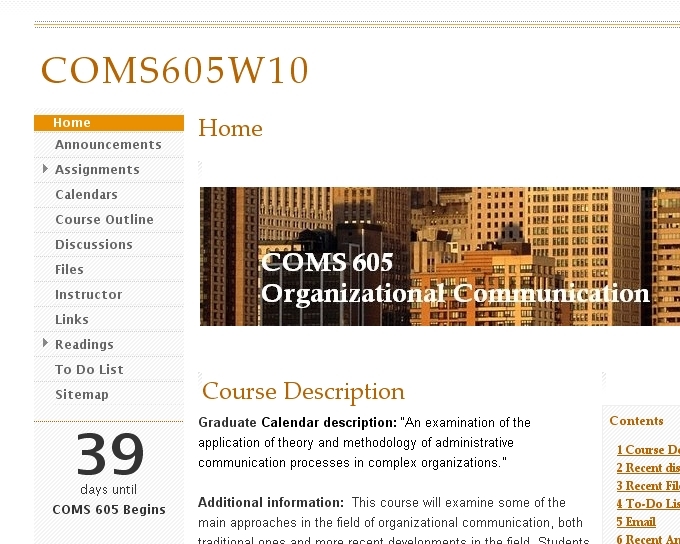 I’ve been using google sites for my education courses at U of A and U of C and it’s worked really well. The only real issue so far has been with the google account – as you note in ‘limitations’. The vast majority of my students have commented on the ease of use and flexibility of the interface. In addition, many schools and districts are switching to google apps environments so the teachers and administrators I work with are thrilled to be able to learn more about it through their graduate studies. Intriguingly, I am teaching a course via moodle in another program at the moment and the contrast is striking. Google, in my experience, is a more stable environment. I’ve been able to trouble shoot all of the ‘technical’ issues myself whereas in my moodle course, the students have access to, and need, 24/7 technical support.